North DeKalb Mall is today approaching its third phase of existance. 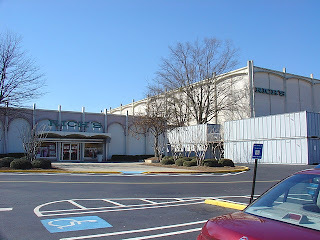 It is one of the least known of the metro Atlanta malls, but is over 40 years old and a survivor considering that two other malls of its vintage are both gone: Cobb Center and Columbia. Opened in 1965, North DeKalb Mall was a small T-shaped mall with a two-story Rich's on the east end and two junior anchors on the west end, which appear to have been a Woolworth's and Colonial Supermarket or even possibly a Cracker Barrel. In many ways it was a sister mall to Cobb Center. It remained a very successful mall serving the growing suburbs from Decatur north, but was marginalized early on by the construction of much larger Northlake and Perimeter, both completed in 1971. Historicaerials.com has a photo of the mall in its original configuration. Supposedly this mall was originally open-air, but as recent as 1968 the mall appears to have been fully enclosed with small skylights. The first and second photos both are of the east court, featuring this big clock. 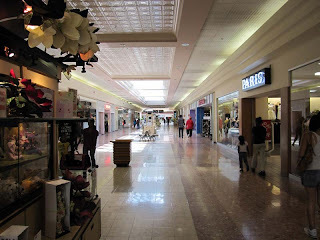 The corridor to the left (original mall) in the first photo heads to the Macy's (former Rich's). In the second photo, Macy's is to the right. 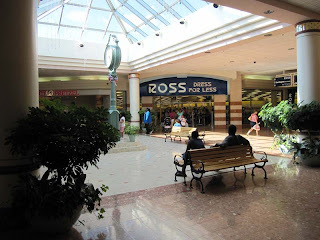 The second photo is one of the two Ross mall entrances. Fortunately, North DeKalb survived because of the fact that mall developers avoided adding a Rich's to Northlake. Northlake had Sears, JCPenney and Davison's...but not Rich's. In addition, white flight from Memorial Drive south was drawing more traffic to the mall than would have gone there otherwise. 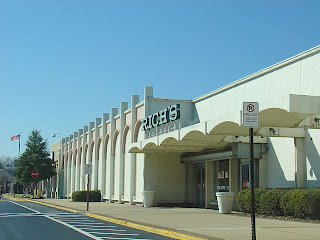 If not for Rich's continued success, North DeKalb would likely have been demolished by the late 1980's or early 1990's. However, it began declining in the 1980's, and that is why the mall today looks nothing like it did when it first opened. 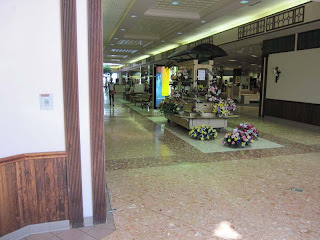 First photo is looking back down the main corridor to the Macy's mall entrance (Rich's mall entrance shown below). Second photo is looking out on the longest (east) wing with Macy's behind me. Last photo is of the mall corridor extending from the east court to south court. 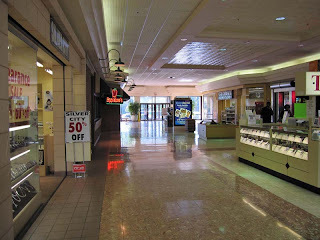 In 1986, North DeKalb Mall was extensively renovated and renamed "Market Square at North DeKalb". This renovation brought a Mervyn's, Upton's and Lechmere to the mall bringing anchors to the area that distinguished the mall from the others in the area. Ross and Stein Mart joined some time later, but it is not known exactly when they arrived or when Stein Mart left. The Rich's at North DeKalb also got a shot in the arm that year when the Rich's at Belvedere Plaza on Memorial Drive shut down for good. 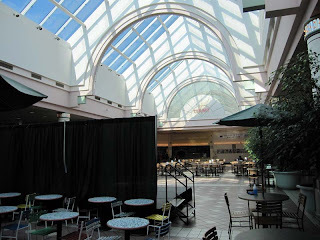 This renovation was wildly successful, and completely altered the layout of the mall with a diamond shape that also added an Applebee's and a food court. This unusual shape was undoubtably intent on trying to build a mall on the same footprint since there was no other way to expand the mall. See this mall map for an explanation of this (I have saved the map for when the mall is redeveloped). Unfortunately, a much greater expansion would have helped the mall more so that it could have competed on a more level playing field with Northlake. Photos include view of south court, view looking down the southeast wing and view looking down the south wing. The southeast wing is really strange: it is part of the mall itself but also a store. While it has a pseudo entrance, the walkway through it is mall while the stuff on each sides is the store. This was a Rhodes Furniture when I visited in 2004. Today it is a local furniture store. The south wing (last photo) is the wing to AMC Theaters that originally opened as a Lechmere. 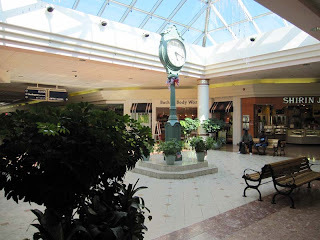 In the early 00's, "Market Square" was renamed back to North DeKalb Mall. By the middle of the decade, North DeKalb was also becoming very troubled. It's solid list of tenants was constantly being shaken up by bankruptcies such as Lechmere in the early 1990's, Mervyn's in 1995, Upton's in 1999 and Rhodes Furniture in 2005. The mall replaced these vacancies with stores like Burlington Coat Factory (in the old Mervyn's), Ross Dress For Less (presumably in the old Upton's) and an AMC theater (in the former Lechmere). With such age and competition, the mall has been managed extremely well, but the renovation is aging, the traffic is slowing and pressure is mounting. 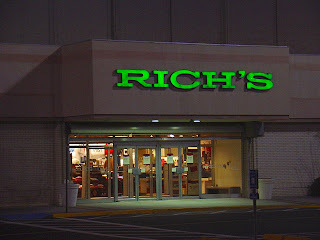 It didn't help when Rich's merged with Macy's in 2004. The Macy's (former Rich's) at the mall is now in direct competition with the Macy's (former Davison's) at Northlake, and ultimately only one of those stores will survive. Considering that previously dated and dumpy Macy's at Northlake has just been renovated and the old Rich's at North DeKalb has not, it is a bad sign. Only one of these two stores will ultimately survive since they are so close, and only because of the ailing condition of Northlake Mall has this remained in doubt. The last plan for the mall involved building a parking deck and adding a Costco. Neighborhoods around the mall fought the plan, but the Costco was kept. The problem with the reworking of the plan is that it will be the end of the center as an enclosed mall. 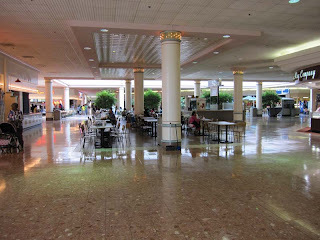 The Food Court makes up the west court of the mall. The first photo is approaching it from the side and the second features the huge domed skylight over the main seating area. The last is looking back from the food court to the west (rear) entrance. Note the Applebee's on the left. This is approximately where the original Woolworth's was located. 2009 looks to be approaching the end of the line for North Dekalb after nearly 45 years of business. The redevelopment plan will become a cluster of big box stores traversed by a new street cutting right through the existing mall corridor. The Rich's/Macy's and the remaining big boxes will be retained in the new center, but what remains will likely all be extensively renovated until it is unrecognizable, including Rich's. The webmaster went back and took much more extensive photos of the mall as it looks to be suddenly dying compared to last visit when the mall was still quite vibrant. The Rich's, however, seemed busy as ever, so perhaps maybe the reason that North Dekalb has lasted as long as it has will be allowed to stay. First photo is view of the north court followed by photos of the north wing to Burlington Coat Factory (former Mervyn's) and northeast wing to parking lot (Ross comes off of this wing as well). This photo is looking from east court (at the clock) to north court. 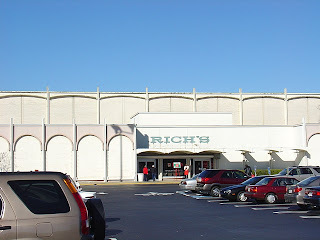 Rich's mall entrance prior to the changeover. Two views of the south entrance to Rich's. This was the best preserved part of the original facade. Note the letters mounted on poles! 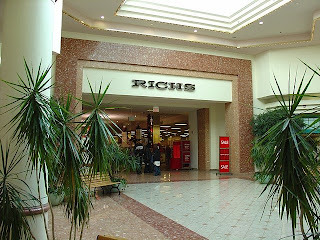 Rich's north entrance falls short of original, but luckily the green signs were retained in the 1986 renovation. Note that the display windows next to the door were covered up as well as the original arched awning. That is still visible underneath the ugly stucco cover. The east side features two entrances. The one-story wing entrance was completely original. The second photo focuses more on it. 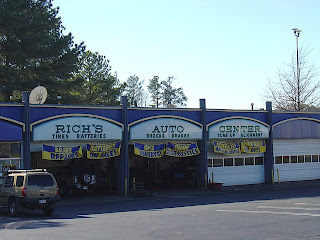 The last daytime shot of Rich's focuses on the auto center. It, too, was completely original from 1965. 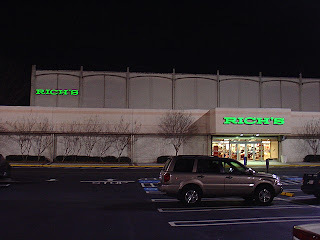 Rich's southeast entrance at night. Note the lightbulbs under the arch. 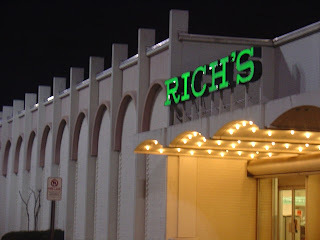 Rich's east entrance at night. The lower sign is in better shape because it is newer: note the forementioned stucco awning. One more look at the south entrance: this time at night. This is my favorite angle of the store. The Macy's sign that is here now is in a big white box in lieu of these poles. I LOVE the photos of Rich's.... great to see! This particular N. Dekalb store was where we visited as a kid when we came to twon to see relatives. There was a bakery at this Rich's back in the early 70's where we'd get red velvet Cake. I can STILL TASTE THEM and they remain a favorite today. 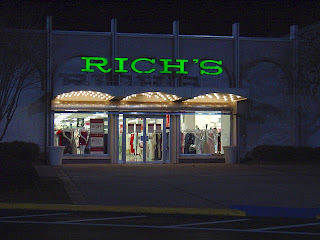 I can't get enough of those famous green letters on the Rich's signs. They will always be a favorite even as they've sunk into history. Great blog! These photos came from "the Rich's project" I did in late 2004-early 2005. 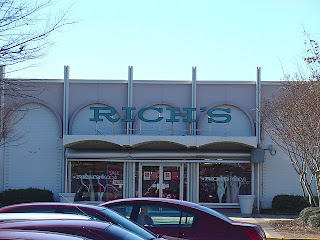 I have photos of every single Rich's store both mall entrance and exterior at every mall in Atlanta and some outside of it. I also have some lower quality shots of the green sign at Cobb Center right before it closed. Needless to say, there's much more where this came from, but I'm crossing my fingers somebody has an old photograph or two to send my way of some of these places. so.... when do you share those great Rich's photos?? You'll be seeing them featured a little at a time. I just hope this blog can handle them all! 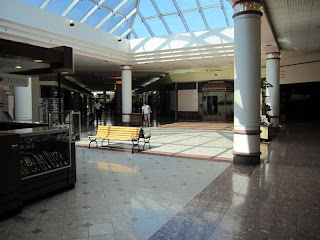 Do you have photos of Rich's Bevedere Plaza? Steve in Decatur, employee of Rich's in the 60s. The Rich's Belvedere photos I've been trying to get for quite awhile. There is a woman that has them (also a former employee), but can't seem to find them or scan them. There is also one photo in the GSU collection of it, but you'll most likely to have to go down there and pay for it, because I had no luck just getting it off the internet. I, unfortunately, never saw the store in my lifetime. I have gotten extensive information about that store and discovered it was opened two months after Lenox in 1959, closed in 1986 and demolished in 1992. I figured out exactly where the footprint was when I last was down there trying to figure it out. Is Belvedere Plaza itself a lot older than the Rich's or were they built at the same time? 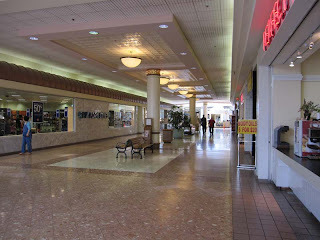 I enjoyed your photos and reminiscences about North DeKalb Mall. I shopped there regularly from the late 60's until I moved away in 1986. I also worked there for two summers when I was in college, at "Bell Bros Shoes". My boyfriend at the time worked a few stores down at "Musicland". Ah, memories! This is one of those malls that has been declared as on its way out since the mid-80's, yet has managed to survive. It seems it works in tandem with Northlake rather than as a competitor, while the Mall at Stonecrest seems more dangerous to the future of North DeKalb and South DeKalb Malls. Perimeter Mall also seems to be the destination mall for North DeKalb, rather than Northlake. I spent a lot of time there as a kid in the late 70s. I remember the rinky dink movie theater, the Hickocks sporting goods store, the Woolworth where you could get hot popcorn, the Orange Julius etc. The place is completely different, and sad, today. My folks still go there regularly to see movies. CAn you tell me if there was a Big Star grocery store at N. DeKalb Mall? Yeah...I say tear it down (save Rich's/Macy's) and build a lifestyle or power center in it's place. I remember attending the opening celebration of North DeKalb Mall as a child. If I remember correctly, it was never an open air mall, always enclosed. Richs was the major anchor, with Woolworths at the other end. Some of the stores were a Milton Bradley, a pet store and art supply store on a narrow side hallway near Richs, a very early Chic Fil A, a head shop, a Cracker Barrel, and a grocery store. I also remember the bakery in Richs--there was also a two restaurants in Richs, one upstairs overlooking the mall and a more casual one on the ground level. As kids, we would walk in the drainage tunnels under the mall. This mall always seemed on the edge to me. I spent many Friday afternoons here in the late 70s. My sister took dance classes in a studio which was attached to the mall and was accessed through a service hallway near Woolworths. 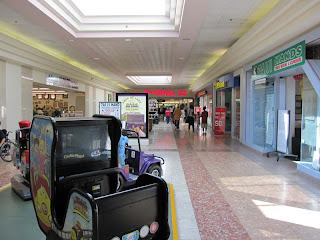 Playes many video games at the arcade on the Woolworths end. Does anyone remember the sad, free merry-go round in front of Woolworths? I took dance lessons at the same studio .... Dolores Werner Dance!!! I took lessons there from the mid 70s until probably 1980 or so. Anyone remember Lechmere? I really liked that store! I remember fondly shopping with my mother at North Dekalb Mall in the 1970s. We'd stop to eat at the Magnolia Room and then shop. I always felt as if Rich's could be my second home! Even as a child, it was comfortable to me. I remember eating pizza at the Gigi's in the mall and was always staring at the teenagers on Friday and Saturday nights. I thought it was the coolest place ever - even with my dad sitting next to me sharing a cheese pizza pie. I also remember a Dipper Dan's shop and a grocery store there. When guests came in from out of town, we always got a coconut cake from the Rich's bakery....great, great memories. 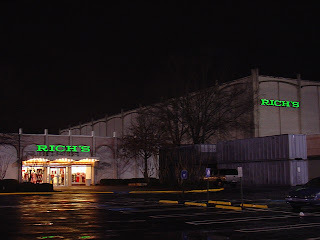 My Brother worked at the Rich's at North Dekalb Mall for many years. I practically grew up in that mall. When I was a teenager I worked for Gorin's in the food court and the Things Remembered kiosk as an engraver. Sad to see things get so bad. I haven't been in North Dekalb mall in many years. 1992 may have been the last time I went, and it still seemed to be doing well then. I'd starting growing my hair long in 1991 and by 1992, it was down to the bottom of my face, and while walking in that mall, a guy told me I looked like John Lennon. North Dekalb was a place I hung out back in the mid 80's, around the time it got the "Marketsquare" naming. Thinking back on it, it's actually hard for me to remember why I spent so much time there, and it wasn't easy for me either: I had to take the bus. Hmm.. I really have no idea. Weird. Anyway, North Dekalb had a $1.00 store which was the very first one of those I had ever seen, and I did think that was neat. The Woolworths was nice too and one of the few left by that time. Loved the PharMor store. What an amazing place that was, and again I had to cross town on the bus to shop there, but it was so worth it. Makes me angry thinking about how that company died. North DeKalb has just had some bad luck with tennants: One after another after another Uptons, Lechmere, PharMor, Mervyns, and Woolworths have all ceased to exist. I give the mall credit for hanging on AT ALL given how the ground keeps getting yanked out from under them. Is the Costco deal still on? I haven't heard word one about it since they were trying to get a section of the parking lot rezoned for the Costco gas station. There just hasn't been any recent news at all. Weren't they supposed to begin construction this summer? So if I want to see what the old Cobb Center Rich's store was like, I need to hurry up and visit North DeKalb? I didn't know that the Northlake store had been renovated -- too bad that I never have wandered over there. Thank you for preserving this and other sites before they meet the wrecking ball or otherwise become victims of time! Next time I'm home I need to buy you a beer. No, two beers! Stein Mart was added around 2000. It was a ghost town everytime I was there. It replaced one of the previous failed anchors. The Marketsquare name was gone by 1998. The mall never solved the problem of its bifurcated clientele--a mostly white, middle class crowd that shopped at Rich's/Macy's (and onlywas there in any numbers during a sale) and the multi-ethnic, but non-white crowd that shopped the mall. It was always odd to be the only white person in a mall where everyone lese was African-American, Hispanic, or South Asian, although I was never uncomfortable. The fast food did better than anything else and there seemed to be a lot of turnover. The mall has never really been able to take advantage of the gentrification of Decatur as well as the gentrification of the intown areas of Atlanta and DeKalb County around Decatur or the rediscovery of mid-century suburban areas places further North. The location is both convenient (in concept), but inconveninet in practice, with poor visibility from Scott Blvd (and a messy intersection). Toco Hills, which has revived and is much more service & restaurant-oriented and the new intown shopping areas near Virginia Highland have done much better at capturing customers who should be equally if not more accessible to North DeKalb. The mall lacks a good adjacent hinterland of stores and some of the nearby shopping has been adversely affected by business decisions (the departure of Cub and Winn-Dixie) or poor locations (The Home Depot is too far away and poorly sited, with inconvenient parking). The Rich's is really hulking and ugly--the absence of windows is a big part of it. Despite the plans for a big box center, i suspect that the mall would make a better contribution to the local tax base if it were be replaced with labs and offices that could be rented by CDC and Emory which both need offsite space. 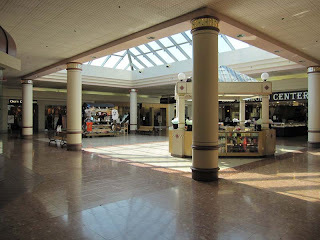 As I recall, prior to the 1986 renovation project, N. Dekalb mall had a Rich's and a Woolworth's anchor at each ends. A very very small food court towards the center that included one of the first chick-fil-a franchises. In addition, the store did have a colonial grocery store and, my favorite, a Milton-Bradley toy store. After the Leechmere bankrupcy, Phar-Mor occupied the space for about 4-5 years until they went bankrupt aftewards, the AMC theatre built a new theatre an absorbed the old Regal 4-screen theatre. I also recalled a large aquarium in front of the Rich's wing - does anyone lese remember? I remember going to the mall in the late 80's and early 90's with my grandmother who lived nearby. Richs, Mervyns and the AMC 16 Theater was really nice. 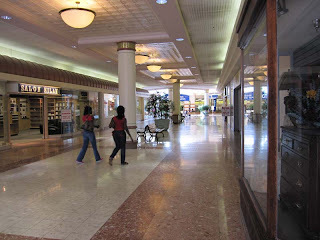 I went to the mall in 2008 and it was truly ghetto! Old Navy and The Gap had moved out and the food court was a mess not to mention Macy's. I can't comprehend how the mall which is in an affulent WHITE area has gone so bad. 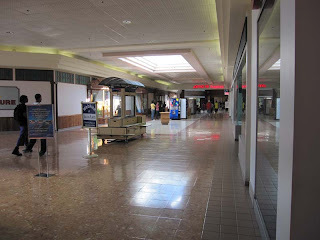 I moved to the area just last year, and North Dekalb Mall suffers from the same fate that all malls of it's vintage seem to share, high vacancy rates and a general feeling of emptiness. I don't want to make it sound like it is a ghost town, it isn't, but there are definitely more vacant stores than I'm sure the owners would like. Of course, this is an affliction of many malls, it seems once a mall hits 20 years old or so, everyone starts going to whatever newer mall is 'nearby'. Northlake has quite a few vacancies, Gwinnett Place had even more vacancies than Northlake last time I was there a year or so ago, etc. However, the best part of the current North Dekalb Mall (in my opinion) is the AMC Theater. My wife and I already preferred it since it was so close, but the theater has recently started special pricing. Monday through Thursday evenings, regular movies are just $5.50 (for adults! ), 3D movies (they have 1 3D screen) are $8.50. The same pricing is also in effect on the weekends before noon. In the age of astronomical ticket prices, this is a refreshing change, and my wife and I have been going to many more movies because of it. Final comment: I had read about the proposed Costco about 2 years ago, just when the economy was going down the tubes. At that time, I read that Costco had postponed all new stores until the economy picked up. Unfortunately, I haven't heard anything since. As a Costco member, it certainly would would be nice to not have to drive 15 miles out to Gwinnett or Perimeter everytime I want to shop at Costco. While I'm dreaming, a Trader Joe's would also be awesome. I hear the old Lechmere/PharMor/Rhodes space is becoming a Marshall's now. I've seen them working there for what seems like at least a month or two. I got to upstairs in the funky office space they have in there on the side where the AMC signage is when it was still some sort of furniture store. Very weird space, plus when you were in the sales areas of the furniture store you could sometimes clearly hear the movies going on next door. There's also an angled wall off to the left of the main entrance that I think was maybe an older mall entrance, or maybe the original Lechmere entrance. If you stand far enough back in the lot you can see some glass peeking over the wall. The reason North Dekalb is going down the toilet is because of its proximity to 285 and Memorial Drive. That area has taken a huge slide and North Dekalb has gone with it. They just don't have much to offer. Once you head east of downtown Decatur, the income level and demographics change considerably. I did go to the Macy's in February 2010 and it was doing great business, I even bought a winter coat. I went to Burlington Coat Factory when I was pregnant in 2007 to try to buy some baby furniture but I was totally ignored by the employees so I went elsewhere. They clearly didn't want to wait on me. You worked at Sargent Singers? LOVED that place! Looking for pics if ANYONE has some! Been looking for a pic of that place forever if anyone has one! Not sure what a previous poster meant about this being close to Memorial Drive which isn't accurate at all. If you pull 1-3 mile demographic rings around this mall, the median and average incomes will be far off. That means there are people nearby that are very well off and skewing the average household income higher, but the median income will be far far lower because the vast majority of households nearby are the low end of middle class. The Costco redevelopment never happened.... they opened a new store in late 2010 in Brookhaven instead. Marshalls moved there too. The current demographics of the mall relate directly to our car culture. N. Dekalb is the first mall easily off of 285 going north from this shopping-poor side of town, and Northlake is the next. I have friends on the far east side of the metro area (Snellville, St. Mtn, Lithonia) that attest to this convenience. The immediate area around N. Dekalb is only median income (I know; I live there). The higher income Morningside/VAHI/Druid Hills neighborhoods are just too far away for the mall to be a lure (esp. considering the alternatives of Lenox, Atl. Staton). What no one mentions is that N. Dekalb Mall has zero road frontage, something that has always puzzled me, and that any developer wants to have. Imagine putting up a major development in this day of intense competition that cant' be easily seen (or accessed) from the road. I'm a few years late on this. I remember the merry go round in front of Woolworths. I was little at the time. It wasn't sad to me since I didn't know of bigger and better carousels and wasn't concerned about whether there were only a few horses. There was a drugstore with a lunch counter across from Woolworths, and I think the place had a yellow and orange color scheme. I remember getting grilled cheese sandwiches there with my father. I also took dance lessons in the mall, that was Dolores Werner Dance Studio, accessible by an exterior entrance on the backside of the mall and a series of service hallways that connected near the Milton Bradley, Chick-fil-a and a record store where I bought my first 45, Toni Basil's Mickey. The restaurant on the second floor of Rich's had a balcony overlooking the 1-story mall, and I believe that was called the Magnolia Room. The bakery in Rich's was unforgettable and there was also a cafe about 4 steps down in a sort of pit area toward the middle of the store. Some of the same Rich's employees are still there and this is one mall that truly tugs at my heartstrings. Even though I attended the grand re-opening on the last day of school in 1986, I was sad when it was renovated in the 1980s with peach and mint green. I've searched my old family photos but can't find any shots that show the flagstone flooring in brown, orange and avocado green, or the large latch-hook rug style murals outside Rich's in brown, tan and ivory. I would love to see this mall and Phipps Plaza in their earlier forms, as well as the old entrance to Rich's at Lenox that had a large stage area above the Piccadilly and a big "O" sculpture made of a reddish tortoise material. So many memories. My parents took me there as kids in the 70 early 80. I the 70s we had car shows. Toy for tots drives with the marines. My dad was a gm employee like my grandad also. My grandparents and aunts and uncle shopped a many day there. There was a hobby shop there. Milton Bradley I spent a many day and birthday and Christmas there. That's where I found out about cox gas powered cars. They would have races in the parking lots. Later we would race remote control cars there in the late 70s Jerobee commander. Was the car my dad bought me there. I think he paid 75.00 new for it in 70s. My grandad loved going there to look at model airplanes and figure out how to make my cars faster than others. My great grandmother daisy loved to get coconut cakes from richard bakery. My dad and grandad grandma and great grandma have all passed away now. 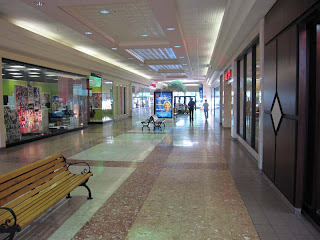 I sometimes pass by north dekalb mall I get a tear in my eye ......I remember all those great times in my childhood spent there like my family and stores that were there......they are all off them a distant but great memory. And I would never trade them for anything. My mother owned the Merle Norman Cosmetic Studio in the mall from the beginning of the mall until the renovation. I literally grew up in the mall and knew many of the business owners (yes, back then there really were non-chain stores in the mall). I personally worked at Hickory Farms (not Cracker Barrel as mistakenly mentioned), Woolworth's and the Orange Bowl (early pizza & hot dog restaurant)- pre-food court. As mentioned by a few there was a Colonial grocery store on the Woolworth end. In addition was a barbershop, Sigger's Cutters (hair salon), an HFC loan store, Bride Beautiful, Merle Norman, Rice's Casuals dress shop, The dugstore with the lunch counetr, Reeder McGaughey sporting goods, Dipper Dan Ice Cream shop,Pizza by Gigi, Milton Bradley, a moie theater(I believe it was only one screen), a card shop,a gift shop, Decatur Federal Savings & Loan, Casual Corner dress shop and other similar stores. In the next few years saw Chick-fil-a, Davis Brothers cafeteria, Orange Bowl reataurant, American Burgers, and an antique shop.i could go on but that is all for now. I worked down the street at the Ford dealership back in the lat 70's early 80's and North Dekalb mall was a nice place to shop and eat , I remember Woolworth grill and Davis Bros. cafeteria sadly so much has changed in the area. No one mentions the book store, but that's what I remember. When my mom was doing a play there (circa 1980), I would roam the mall and spent the most time in that book store. They had a lot of comics compilations (Marvel Son of Origins) and paperback collections (I bought the Spider Woman one after weeks of indecision). They also had the comic adaptation of the movie 1941 and these comic collections were always prominently displayed. It was the coolest place fro me in the whole mall. 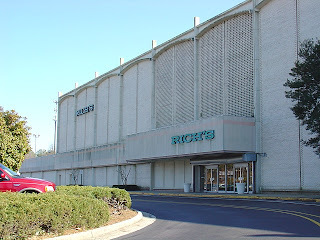 The bast part of North Dekalb mall was seeing the old man who played Guitar at the entrance of the Rich's. If anyone has information on him I would love to contact you or contact me please. Macy's is closing officially this spring! No one mentioned Radio Shack! This blog rekindled many wonderful childhood memories for me. The old man that played guitar outside the Rich's entrance was blind, elderly, kept a coin cup for donations attached to the neck of his guitar, if memory serves me correctly, but now in 2016, I'd be willing to bet he passed on long ago. I remember when the bathrooms inside Woolworth's (I think it was that store) required TEN CENTS to be deposited into a coin-operated mechanism on the door to unlock it to give you access to the bathrooms! Even as a young child, I remember thinking that was strange. I think it was around 1980. I was born in 1971 and grew up just a mile from NDK Mall from 1977 until 1993. My disabled mother and brother remained in my childhood home until this year. I remember two different music stores in the mall (records & tapes) but cannot recall the store names. 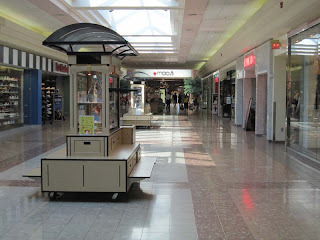 I remember riding my bicycle through the mall with a friend as a teenager early on one business day when the mall had just opened and had virtually no customers and no one seemed to notice us. I worked at Wendy's in the food court in 1995 and briefly as Mall security that same year, as well as at one of the Chinese food restaurants in the food court. The eyeglass store in that mall is where I was fitted for my very first eyewear in 5th grade. My dad helped my pick out the gold/brass colored fames. I would lose him just 2 years later in 7th grade at age 12. He was 41. I'm now 45. My girls are 15 & 17. The mall has managed to survive somehow but it is a very uninviting and badly aged environment. I see no purpose to ever return.